This is the first trip that, instead of a paper journal, I took my iPad mini along, so my travelogue will be that much more timely in boring you. Simultaneously, I'm working on the photos, so this is a work in progress, as I add links, photos, and links to photos. Quick review of the bluetooth keyboard for the iPad, from Anker: The tiny keys are sort of a must since it fits the mini, but the lack of a ' key really cramps my style. To get a ' you have to do a weird function button-o. Mainly I'd reach out for the ' and get a return instead. Made a lot of typoes, and it requires a firm surface to type on to press the keys down firmly enough. As a tiny keyboard of necessity, it's not bad, but not something I'd ever use by choice. Started off fairly well with food at LAX, getting sandwiches from the Ink Sack. The Jose Andrés had ham, chorizo, manchego, tomato and lettuce. It was spicy good, and reasonably priced, compared to some of the other restaurant offerings in the international terminal. I'm looking at you, Border Grill. Rebecca had the banh mi, which was also tasty, but I was happy with my choice. We've boarded the plane and now we've got some eleven hours of travel ahead of us. Air Tahiti Nui was perfectly fine. I didn't expect to get much sleep and I was right. Watched The Kingsman, which was a good-for-airplanes movie. Then tried to doze while sitting just maddeningly short of fully upright and depressingly far from anything resembling a sleep position. There were fairly frequent bouts of turbulence, which I actually welcomed, because I found it strangely soothing, and it made most people on the plane shut up for once. Meals were fine but anonymous. But free champagne ain't all bad. One new thing on us was that French regulatons required the staff to, I dunno, go down both aisles spraying air freshener or lysol or deodorant or something. Crazy. I wanted to stop at one of the info kiosks to buy a museum pass, and there was only one person ahead of us in line, but it was a Sikh family that seemed to be planning an entire Paris itinerary. We eventually ditched the line. Next find, ATM. Pulled out euros. Next, the train station, and we navigated the kiosk for tickets. Got on the train for Paris. Halfway through, someone came through the communicating door, and I saw he had a speaker on a wheelie frame, and thought "DJ? ", and then saw he had only one speaker, and oh Great Cthulhu, a wireless mic. Yes, he stopped and started singing to recorded music on our train, literally standing right next to us. I went into my fullest frostiest do-not-make-eye-contact mode. We thought we could walk from the Gare du Nord to the hotel, but somewhere on the way we mistook the Boulevard de RateuRoach [or whatever] for the Rue RateuRoach, and got turned a bit astray. The marche futile had to come to an end, so we ducked into the Metro and got *that* system sorted out. Enough time had been frittered away that our room was actually ready when we got to the hotel [which incidentally is near the Moulin Rouge] and we spent some time regathering our strength. 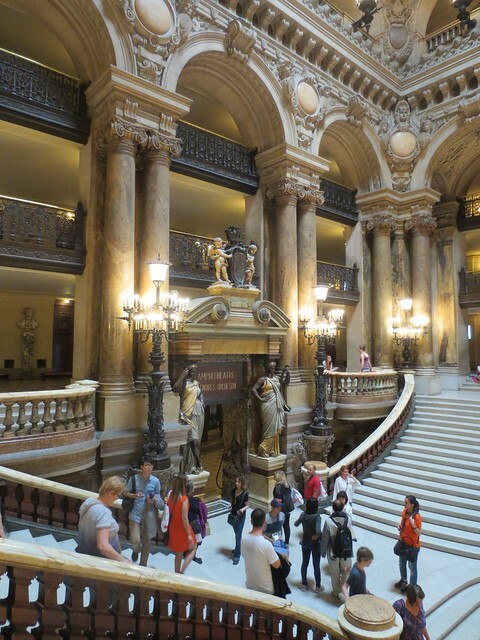 But we were game for more, and ventured to the Opera Garnier, a real palace of a building and home to the fictional Phantom and real-live continuing performances. The building is gorgeous everywhere. Built to a large scale, and ornamented wherever possible. Since it's still in use, you can't really enter the theater itself, although one box is accessible to let you see inside... where they were undergoing rehearsals, which was neat. 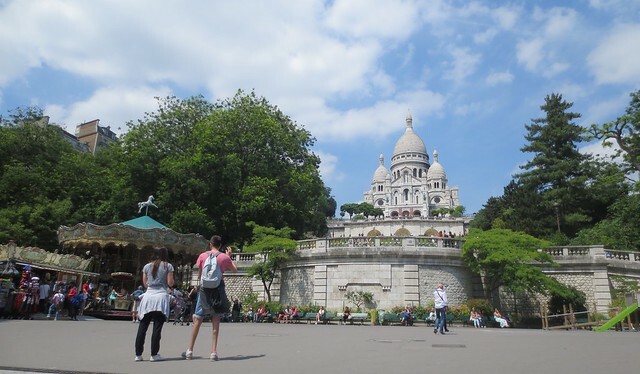 From there we made it to Sacre Coeur. Below it along the hillside is a carousel and park area, and then the church itself sits at the top of the hill. No photos allowed inside, but it's interesting for having art nouveau details (being completed in 1919). We looked around for a bit, and then I made one of my rare decisions to NOT climb up to the top of a church dome. Back near the hotel, we stopped for some nice charcuteries and a couple beers at Cafe de Luna on the corner near our hotel. A welcome spot of relaxation. Now we're taking a little more time relaxing before heading out to a nice dinner at Les Tantes Jeanne. A lengthy if very fine meal here, starting with chicken liver terrine, with tasty onion relish/jelly and toasts & such. Dr. Pookie had the pikeperch, which she found amazing, and I was also blown away by the 'pork tbone', sortofa bone-in piggy strip steak with just the perfect amount of cooking on the crispy fatty edge (if a bit over done in the meat). Came with fine mashed potatoes, and a baked onion thing that wasn't very easy to eat. This sounds lackluster, but it all looked and tasted fantastic. For afters, we splurged on a Persian black lemon tart, and it was really fine. The lemon curd was delicious, but the pièce de résistance is the baked meringue: crispy and brown on the outside, still gooey inside. And now at last to sleep. - a Buddhist monk on his cellphone near Sacre coeur. - three guys in lederhosen walking down the street, with the last one eating noodles out of a tray with chopsticks. Next day got to a slowish start, but Metroed down to the Ile de Paris. 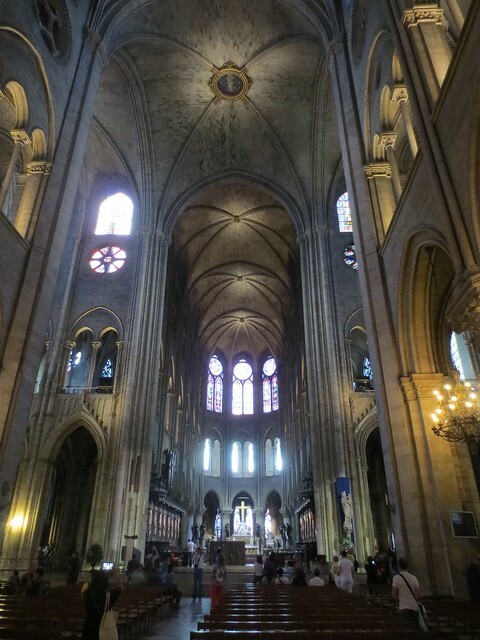 Took a quick gawk at the 'Flamboyant Gothic' Saint Jacques Tower, all that remains of a church destroyed in the Revolution, and then to see the epitome of plain-old Gothic at Notre Dame. The line for climbing the tower and seeing the bell was ferociously long, so we skipped that and settled for a visit inside. Hard to say anything original about it. It's Notre Dame. Stained glass, medieval art, kings and saints and ceilings way above. We soaked in that ambiance, and then headed to the Louvre. With the museum pass, you can skip the ticket line, and that alone may make the pass worthwhile. The line was enormous, but the fastpass lane was pretty empty. 1) You enter through the giant ugly pyramid, and then you get lost. 2) You pick up a map from the desk, hopefully in your language, and set off in a random direction, since every direction will take you to something you'll recognize. 3) You identify that thing over there as Egyptian, so now you can find yourself on the map. 4) You cleverly map out a path to get your morning coffee, and get lost. 5) By the time you locate where you are now on the map, all cafes are now mathematically as far away as possible. 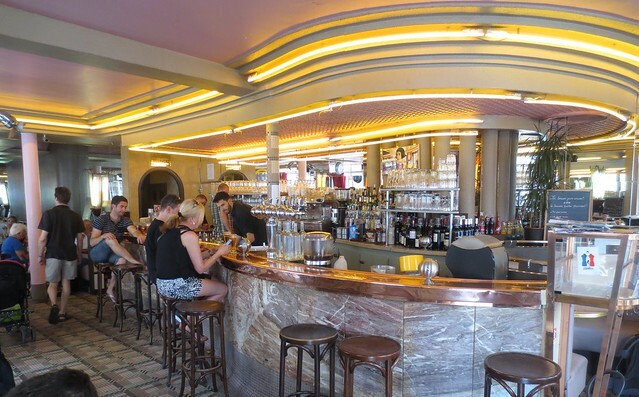 6) But you follow a new route, and arrive at the Cafe Richelieu. A line forms and it doesn't move, ever. But you need your coffee, and you are not moving. You stay in line, and at last a lunch room opens up, and everyone is seated, and you are given a handsome menu with descriptions of delectable pastries. You attempt to order a pastry, and are told it is lunch. You can't have a pastry. What are you, American? 'Yuck! Pastry at this hour?' You grudgingly eat a miraculous "tartare" of asparagus, avocado, apple, and grapefruit, and consider yourself lucky, or the waiter might taunt you a second time. 7) After leaving, you see right next to the cafe a lovely outdoor terrasse with pastries galore. 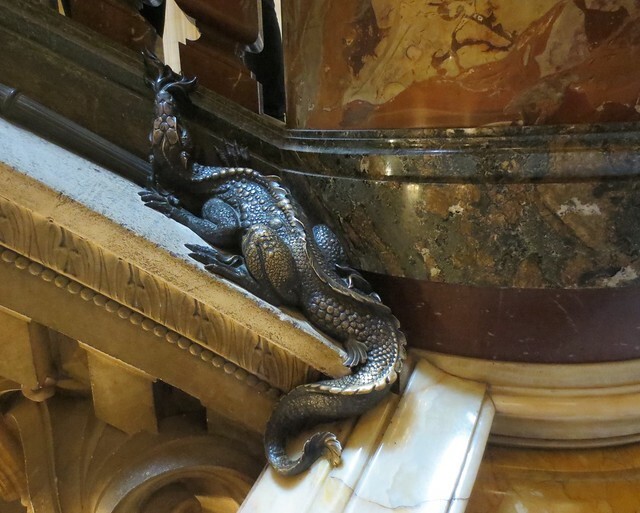 8) Just to spite the French, you go ogle the rest of their art treasures anyway. I'd been told so many times that the Mona Lisa is small, that I was surprised by how big it was, even if I couldn't get anywhere near it for fear of being struck by numerous selfie sticks. The selfie stick is a remarkable plague. They are ubiquitous. You may even see chic young ladies with a tiny purse too small to hold the selfie stick that is jutting out like a collapsible police baton or something. 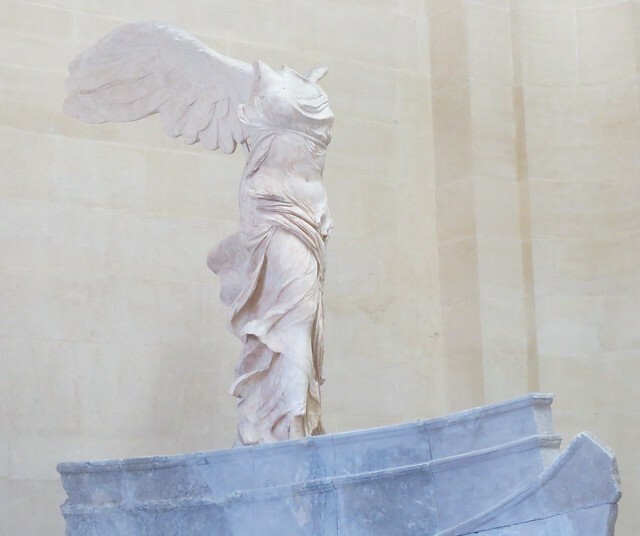 I was very happy to see the Nike of Samothrace, and charmed to see the Venus de Milo. I obediently went by the Mona Lisa out of duty. In an adjacent hall, Dr. Pookie pointed out another da Vinci that was sitting there forlorn, because it wasn't the famous one. 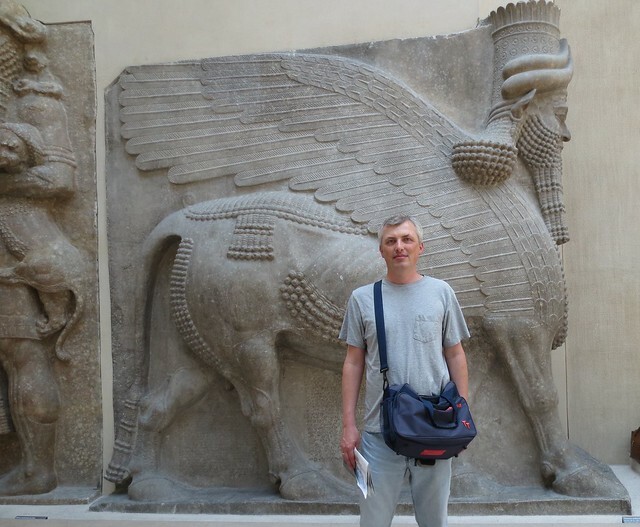 They also have a great collection of Ancient Near Eastern antiquities: the Code of Hammurabi, and numerous man-headed bulls and other Assyrian friezes and stelae. Along the way saw a lot of Egyptian art, Greek art, snuff boxes, statues... just way too much to see it all, but I was happy with what I got to see. Most places, you exit through the gift shop. At the Louvre, if you make your way to the Metro station, you find yourself in a high end mall underneath the museum. 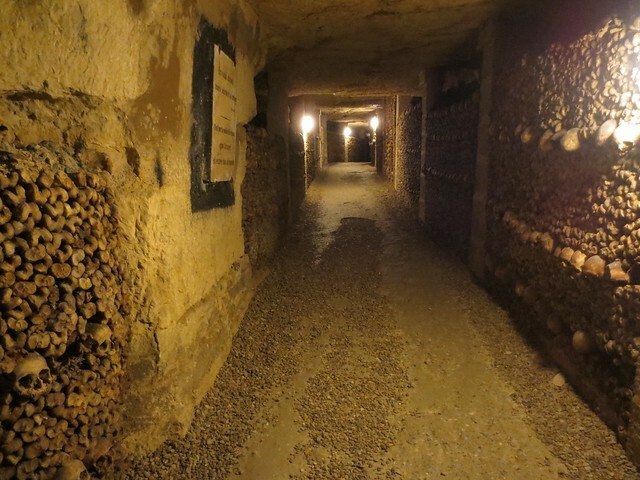 We had some difficulty navigating from the Metro to the local train, but eventually made it happen, to take us to the Catacombs. I was in need of a beer, but Dr. Pookie wanted bones first, beer later. Alas, there was a line, but we met some single serving friends from Memphis (TN, not Egypt) and whiled away the time, until we got down into the catacombs. Another interesting detail of the wait in line was that there was a taxi strike in the city today, and the taxis had parked their taxis in the square and roped it off to prevent access, though they let emergency vehicles through, and occasional moped would duck under the barrier. They apparently shut down many squares in the city, and rumor was that a car that tried to cross the 'picket line' at one of them got flipped over, causing the gendarmes to swarm in. 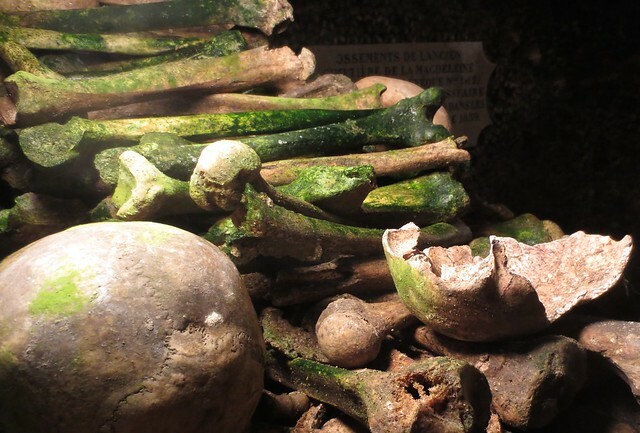 Once inside the catacombs it was blessedly cool, and we descended into the slghtly drippy depths, passed along long passageways, and eventually saw just a stupefying number of bones in the ossuary. Mostly thighs and skulls stacked together into walls with the other bits tossed behind. It goes on longer than you can imagine. Excitement turns to marvel turns to almost boredom. There are so many dead bodies (well... skeletons) in there that it gets BORING. OK, not boring, maybe, but when the wonder of it wears off and it becomes just normal to see stacks of femurs as far as the eye can see, I'm not sure what the word for that is. Once topside again, we found a cafe and we rehydrated. Beer, wine, lots of water. Dr. Pookie had the salad Nicoise, while I opted for a steak with pomme frites. Fries were great. Steak tasted great, but the cut was not that fine. Still pretty good. And then one long Metro ride back toward the hotel, and a rapid collapse. Over the past day or two, we've been asked a couple times to help people with English. One lady (who was stuck behind us at the Metro ticket machine, and then was on our train) was composing a business letter, something like "our company's ecological commitment has made us choose fully electric vehicles." We offered the suggestions of 'environmental' for 'ecological' and 'all-electric' for 'fully electric'. Then after I somehow accidentally turned the flash on my camera on, and was chastised by a Louvre guard, he asked for a better way to phrase, "The light makes damages on the painting." We tried to help. Not sure how successfully, since we each offered different advice. The next day, we ventured out to Versailles, taking the train out to the location outside Paris. The train station is quite close, so its pretty easy to soon spot the giant chateau. With the museum pass, we again had the advantage that we didn't have to buy tickets, but unfortunately lots of other people had already bought tickets, and the lines to actually get in had been held up for some reason, so the line snaked back and forth across the giant entranceway. The tour gives you a good feeling for the ridiculous opulence of the time, and also the ridiculous desire for people to use their selfie sticks everywhere. 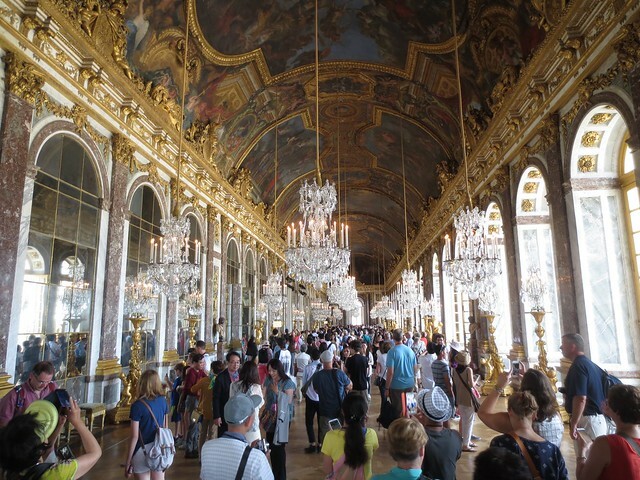 Although people of all sorts had their selfie sticks, I think the funniest were the young Asian girls, who had dressed in their finest clothes and makeup to have their selfies taken in Versailles. On the tour, mostly you see the rooms and their ornamentation, but a few rooms also have period furniture. A more Napoleonic addition to Louis' house is the Gallery of Battles, with giant paintings commemorating French victories from the dawn of Frenchitude (epitomized by a hairy Clovis). With a particular emphasis on Napoleon, of course. 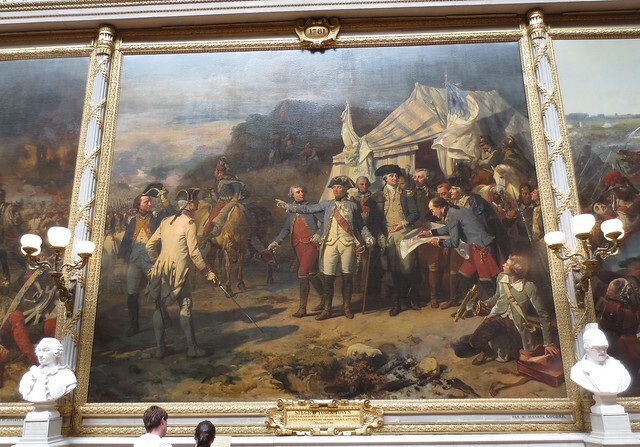 There was one painting depicting the American Revolution with General Rochambeau beside General Washington at the Siege of Yorck-Town. Once outside again, there are the grounds to consider. They are truly enormous, covering just acres and acres (Google tells me 800 hectares, equivalent to more than a dozen Disneylands). 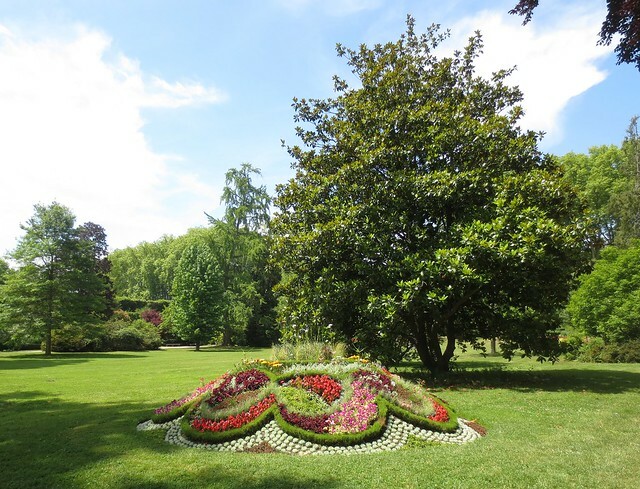 Mostly the 'gardens' are more like little forests or groves of trees with paths through them, although there are a few flower gardens spread here and there. Our ticket included a visit to the Trianon, but we finally just pooped out and gave up on that quest. It was too far away. But we still managed to see some things that probably fewer people see. We drifted along one side of the gardens and out on to the street, leaving the main area of the site to walk a bit through the town to the king's vegetable garden, which is still in use as a sort of museum and experimental gardening lab. Lots of espaliered pear and apple trees that probably date back to the kingdom, as well as this year's crop of vegetables and flowers. 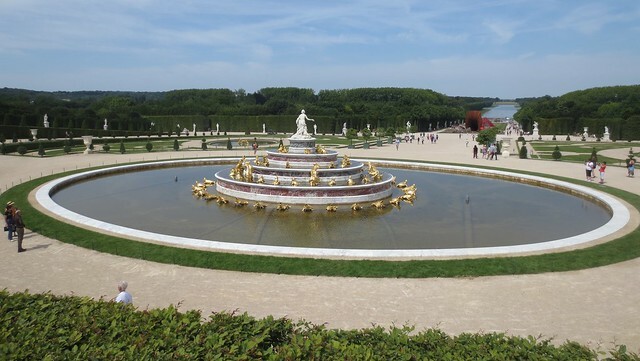 The garden is also home to the only fountain in Versailles that we saw actually running. We continued into the town a bit and found a cafe to spend a little time cooling off with some beer. And then back to the train station. We certainly had not seen all of Versailles, but we'd seen enough and we at least avoided what I assume must be a ridiculous crush at the train station to get back to Paris later in the afternoon. 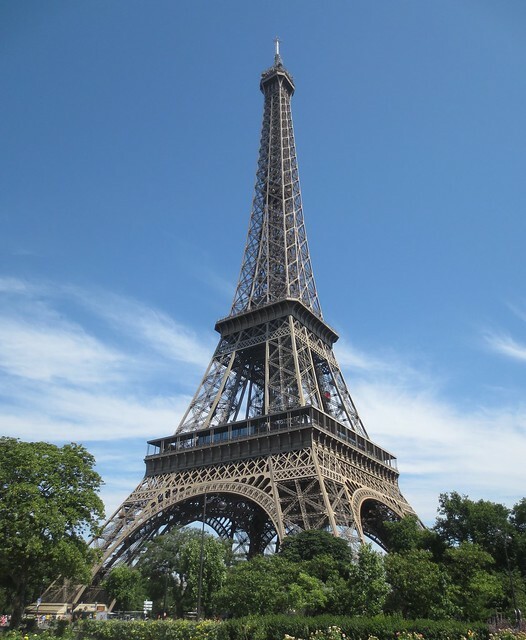 We exited the train at Champs Mars, which is very close to the base of the Eiffel Tower. It's definitely an impressive thing, bigger than my mental image of it. We admired it, walked under it and passed on. If there's a next time, maybe I'll ascend it, but I didn't feel like I'd missed too much. 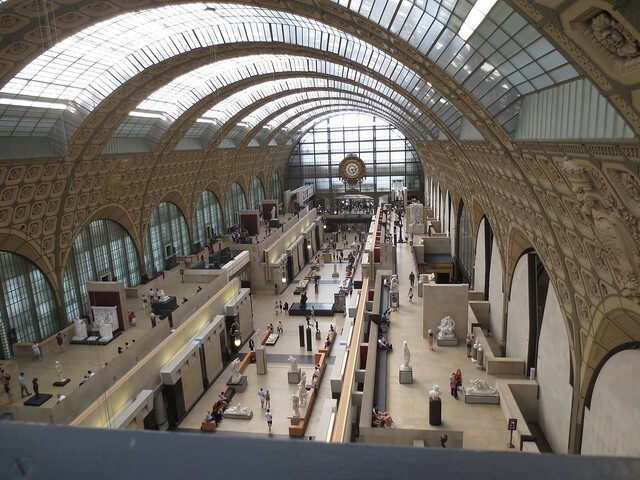 We drifted down the Seine (via Metro) to the Musee d'Orsay, which sadly was near closing time, but we had time enough to see some van Goghs and impressionists and admire the building itself -- converted from an art nouveau train station into a fine art museum. One of the neat things is to be directly behind one of the large clocks that dominates the facades of the building for the once-upon-a-time train passengers. We were pretty dead on our feet at that point, and headed back to near the hotel, where we gave in to tourism a bit and had dinner at the Cafe of the Two Moulins, the cafe featured in Amelie. It's definitely become a strange little tourist attraction of its own due to the film, but the food was quite good, and the happy hour beer price was also good. I had a variation on a club sandwich, with some very good pommes frite. Dr. Pookie had the baked Camembert with salad and potatoes. She didn't quite expect an entire baked cheese, but she found it tasty. We pretty much went back to the hotel and slept, since we had to get up early in the morning. We checked out of the hotel, summoned a taxi (I figured we'd earned this luxury, and didn't have to try to get our bags through the Metro) to the Gare Montparnasse. A quick bite to eat at the station, and now we're sitting on a TGV headed for Rennes, where our next hotel is waiting, and which will form our base camp for getting to Mont Saint Michel today, and other places tomorrow. Last random Paris observation: there are lots of Irish pubs in Paris. Most importantly, you saw the Musee d'Orsay and Mont Saint-Michel. I've been to and loved all of the other places you visited, but those two are very special to me. Those and the Musee du Moyen Age with its Pillar of the Boatmen and Lady and the Unicorn tapestries (always my first stop, as they are both somewhat spiritual experiences for me). So happy for you both!